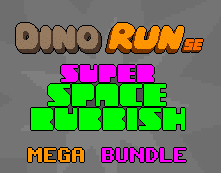 DinoRubbish MegaBundle includes two cross platform games, Dino Run SE from Pixeljam and Space Rubbish from Slakinov Game studios and is available for $5 or more under 'name your price' model. This bundle also includes soundtracks from these games composed by Pixeljam. Dino Run Special Edition was free from October 7 to 9, but I missed the news and failed to report on time. However, you can get these two games as the part of this bundle first released in June. Dino Run SE is a retro styled single / multiplayer prehistroic action adventure game where you control a raptor and you have to outrun pyroclastic wall of doom triggered by an asteroid impact. If you have played the original Dino Run Online you will be familiar with the acclaimed game but the Special Edition add in lots of new goodies. You don't need a web browser to play the game anymore, brings in full screen support, new multiplayer maps, new game modes etc.